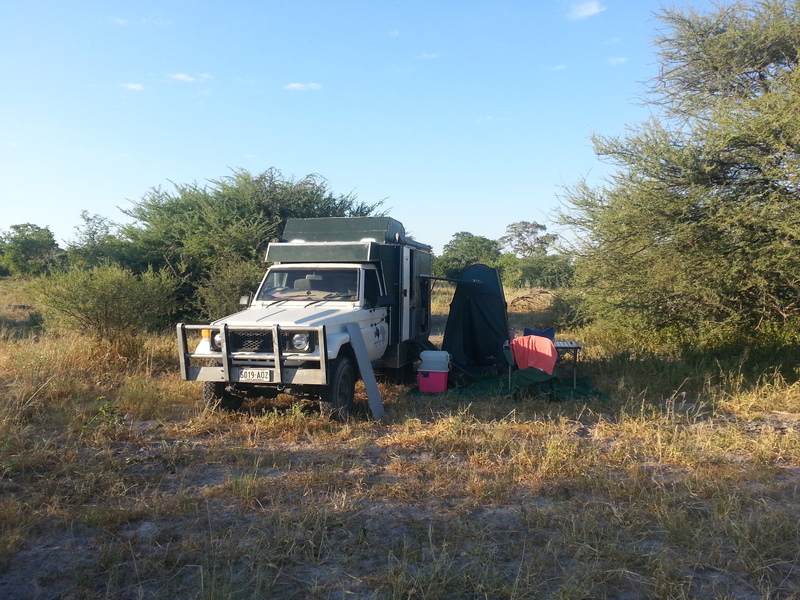 Camped at a wild camp near South Gate of Moremi Game Reserve. We head a lions roar in the morning. We camped here before we headed into the park towards 3rd Bridge. 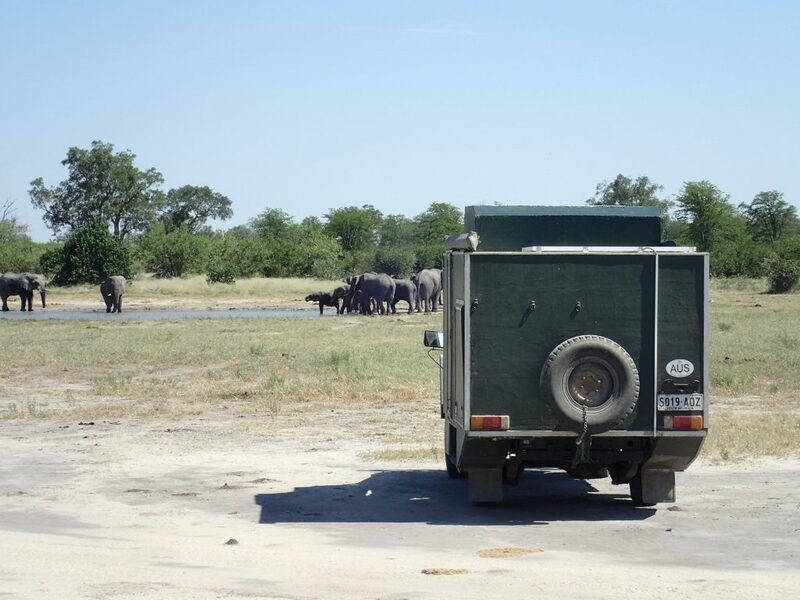 After entering South Gate of Moremi Game Reserve, we drove only a few kilometres to find a group of Elephants at a water hole. Crossing 1st Bridge on the way to Third Bridge. We got lost along with several other people on the way to first bridge. 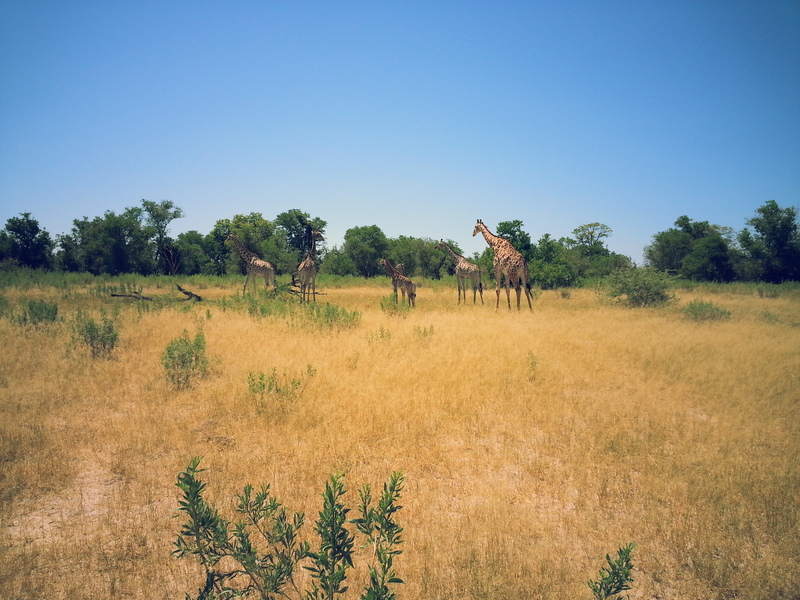 Seeing Giraffes on the way to Third Bridge campsite. 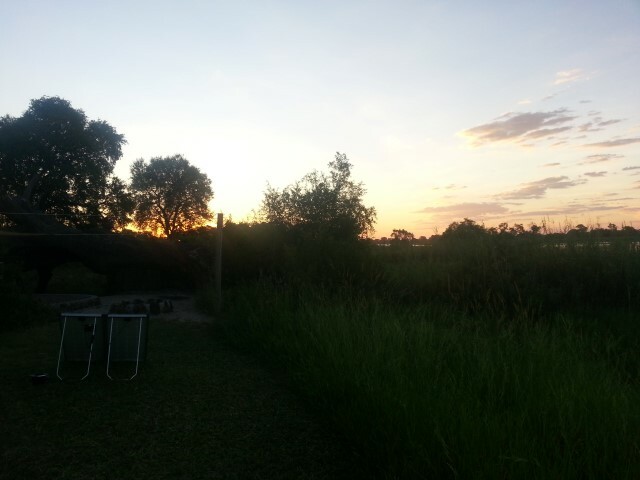 Our first night at Third Bridge in Moremi Game Reserve. 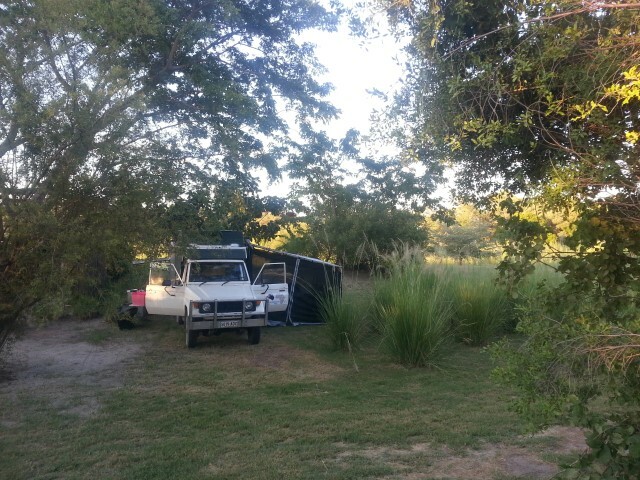 This was the first night at A$140 per night camping at Third Bridge campsite. Camped for the second night at Third Bridge campsite. We had to shift campsite because the campsite we stayed in the night before was booked out. The second night campsite was much nicer. 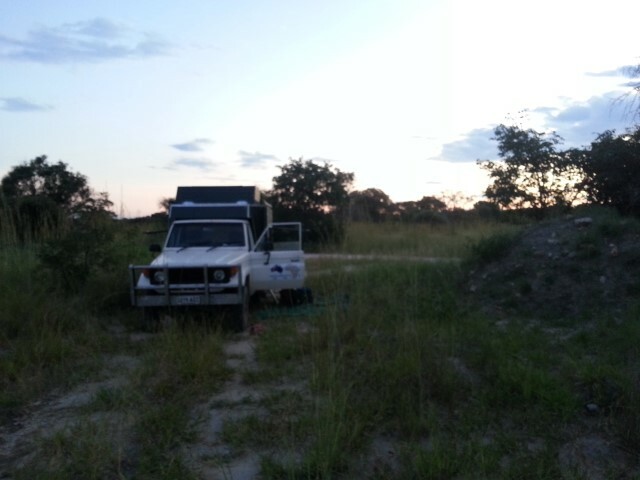 Camped again at the Wild campsite outside of South Gate Moremi. 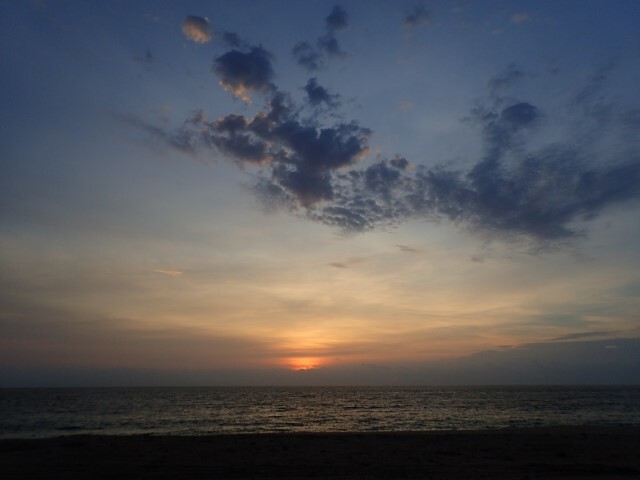 We never got tired of tropical sunsets. 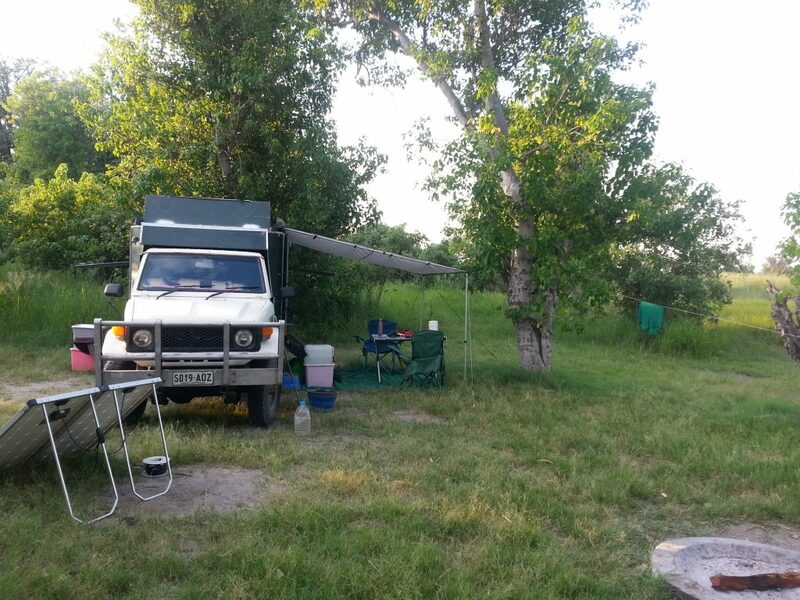 Another very quick one – we’ve just spent a few days camped in and near Moremi National Park. 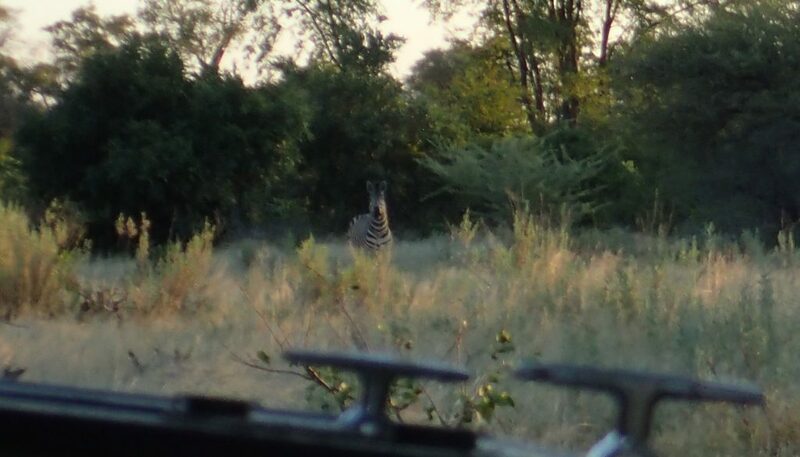 We saw lots of wildlife including a wild dog! Very exciting as they are rare and we haven’t seen one before. 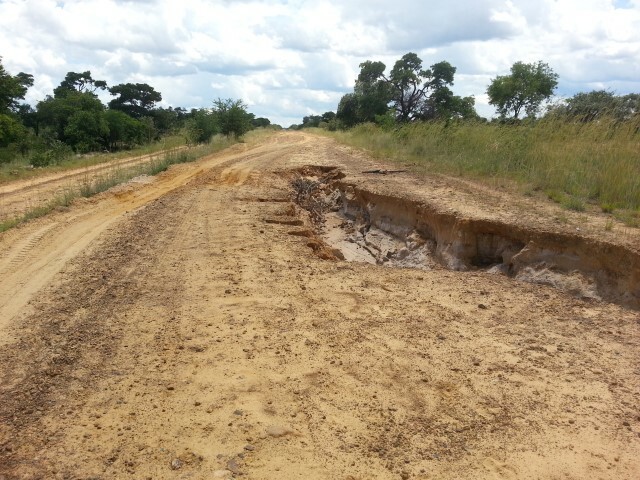 Now we’re heading to Francistown on the A3, which is hopefully a decent sealed road. 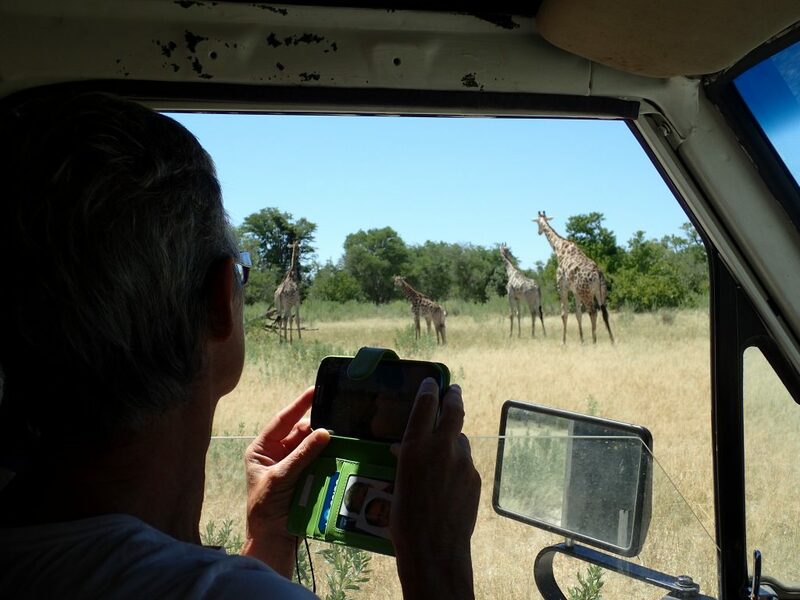 When we have some decent internet, probably when we get to South Africa, we’ll post photos. 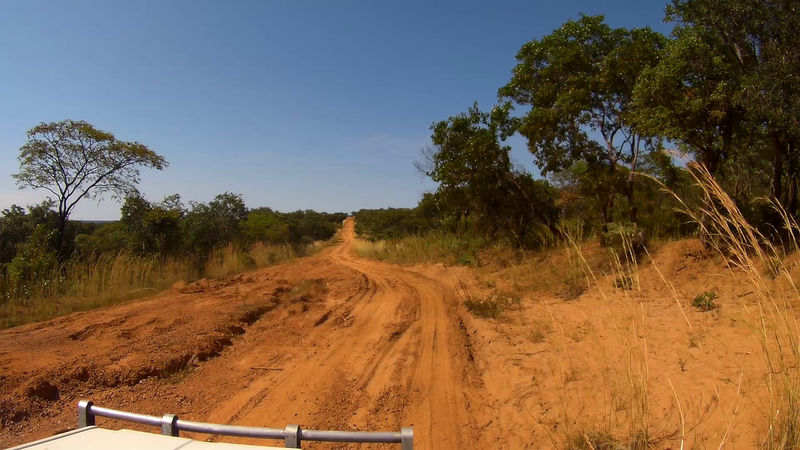 At the moment we’ve hooked into Botswana Post’s free internet access, 10 minutes at a time. 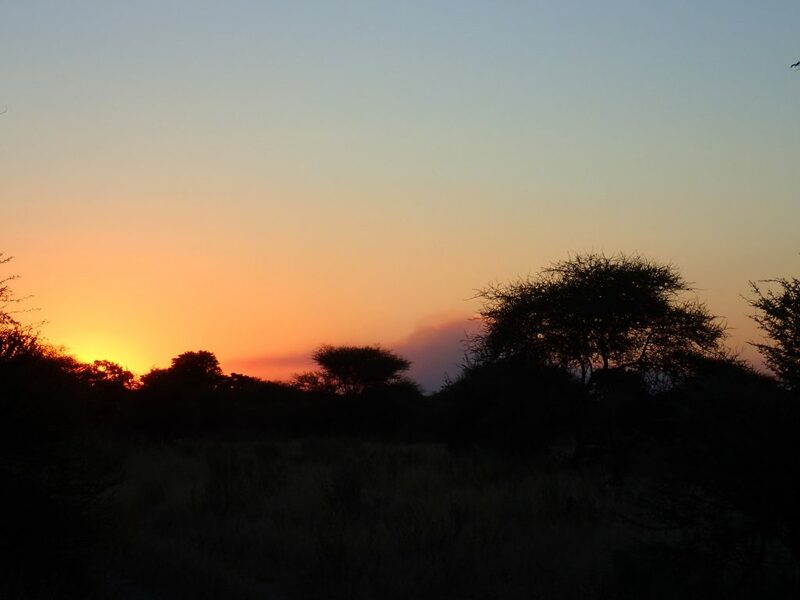 We’re back in one of our favourite countries in the world – our favourite African country (so far!) – Botswana. 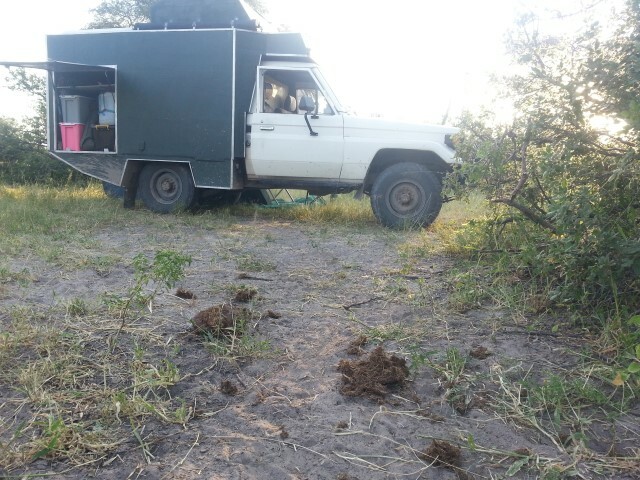 We wild-camped last night and now we’re in Maun (rhymes with town), having just organised to camp at 3rd Bridge in Moremi National Park, part of the Okavango Delta. 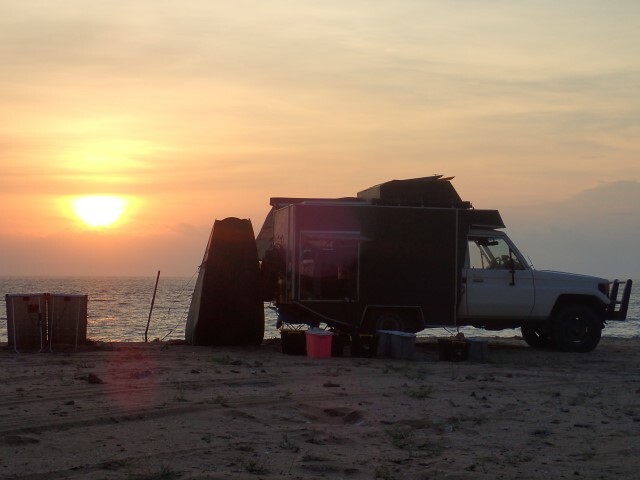 It’s costing us USD $100 per night for a campsite. Yes, you read that correctly. A hundred bucks. US. Per night. We’ll be offline for a few days, see you next week! 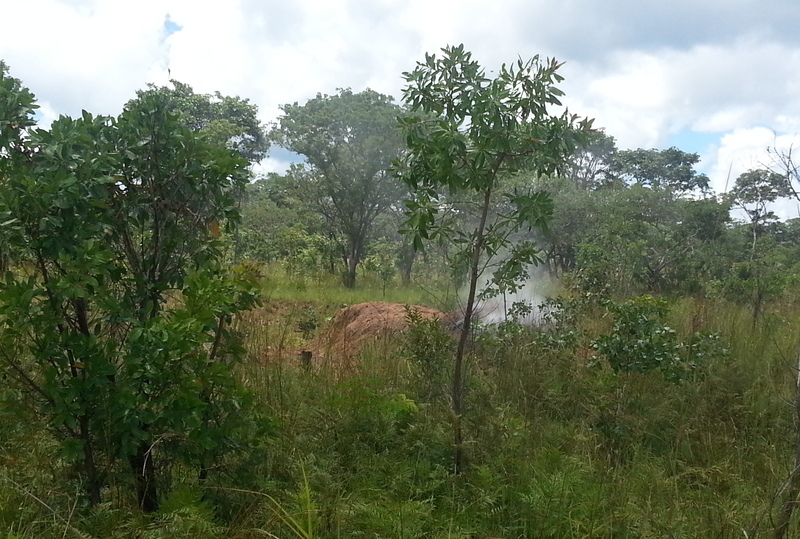 Camped amongst the Elephant Dung. 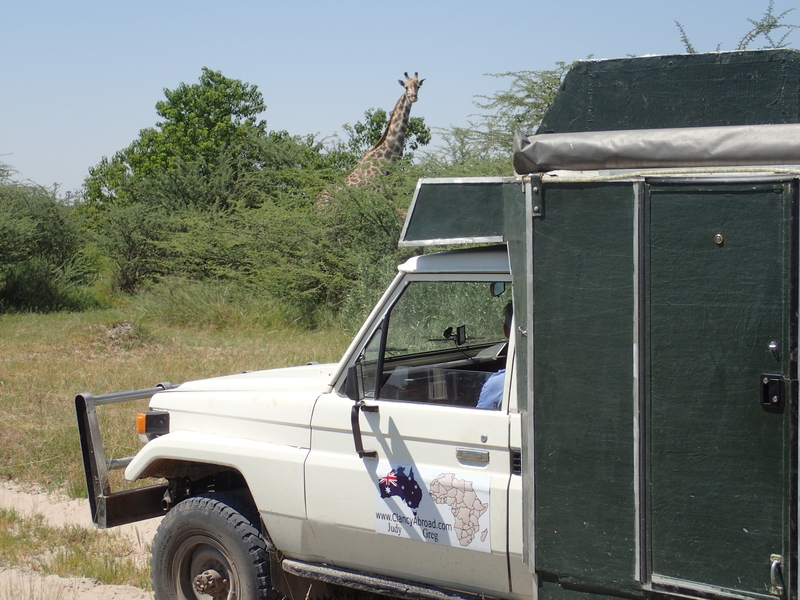 We heard elephants, but we didn’t see any. 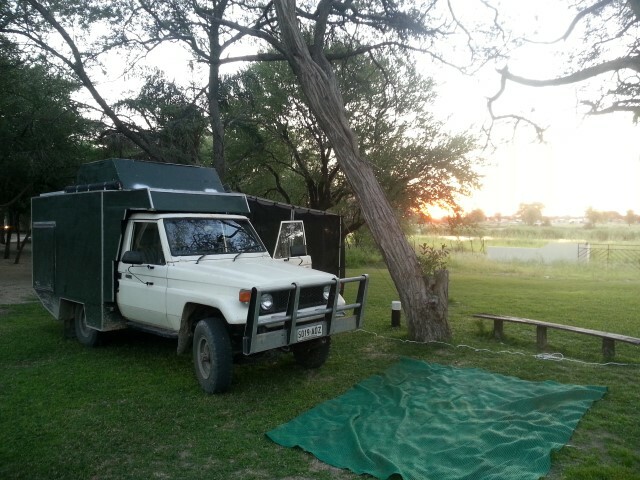 After our median-strip camp north of Katwitwi on our last night in Angola, we were thrilled to find a campground in Rundu that had large grassy sites. And power! And a camp kitchen with a sink with running water! And an amenities block with hot water for showers! We felt like we’d landed in the lap of luxury. 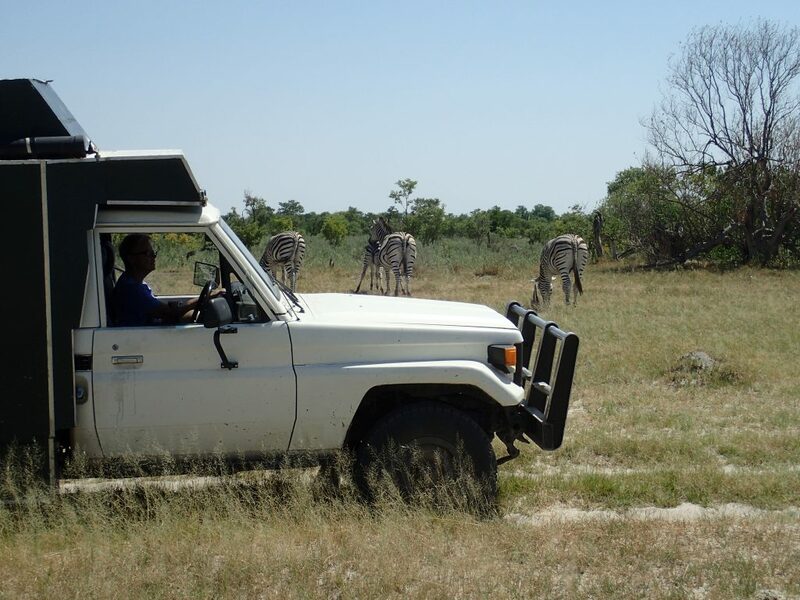 The Sarusungu Lodge is about 3kms out of Rundu, on the Okavango River. 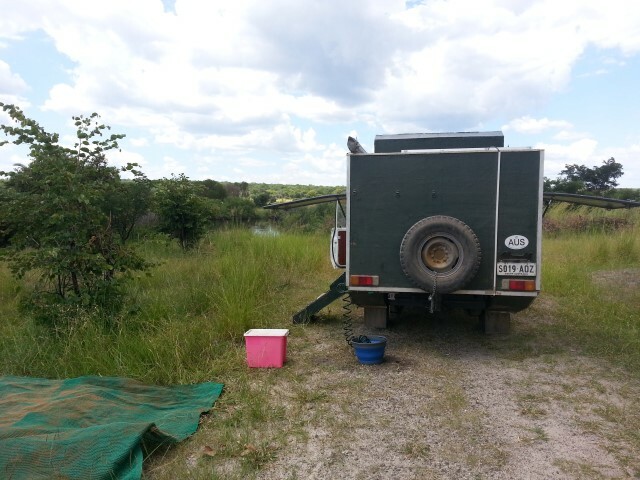 We had river views and could see Angola on the other side. It was close enough to town that Greg rode his bike there a couple of times, once to buy some things and then to book Clancy in for a wheel alignment. We spent the weekend at Sarusungu. 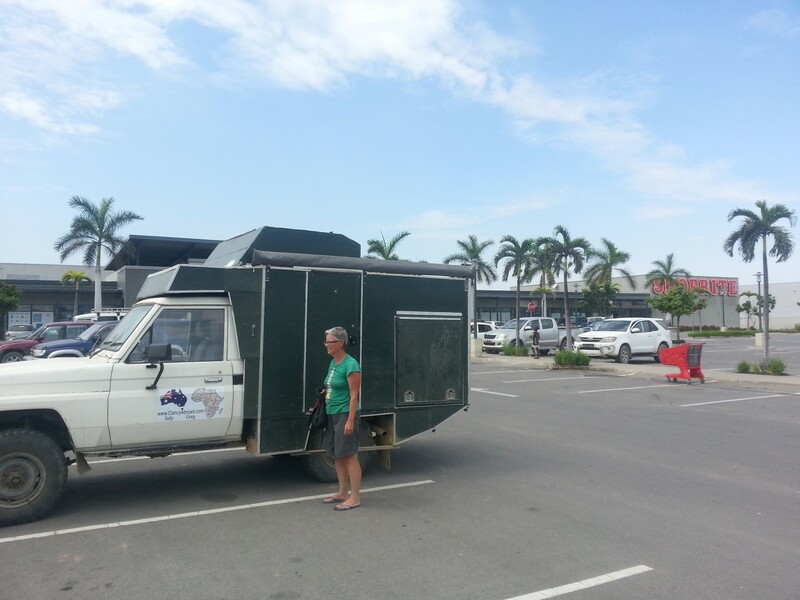 Greg did some repairs to Clancy, with the assistance of one of the campground’s groundsmen, who offered to lend tools, suggestions and probably learnt a fair bit about fibreglass in the process. 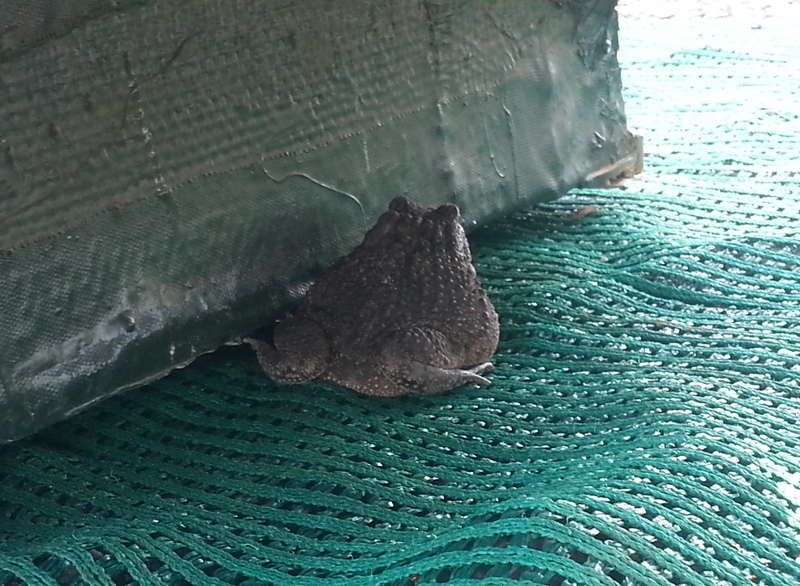 I wish I’d taken a photo of the 2 of them sitting together on our green camping mat, peering up at the hole in the wheelwell and figuring out how best to repair it. 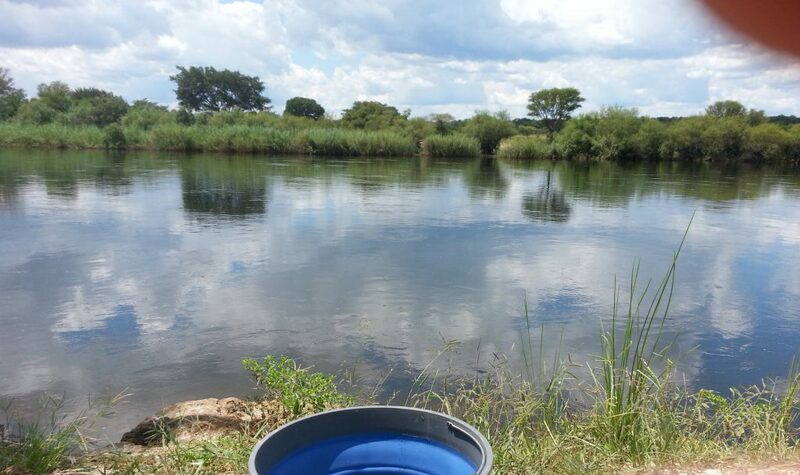 Meanwhile, I did many, many loads of handwashing, and felt very lucky indeed to have a sink with cold, clean running water and not have to trudge up to 2kms to get that water from the nearest tank/river/creek/dam/puddle. And then to be able to hang it on a clothesline I’d strung between several trees. With pegs! Angolan women spread theirs out on sand or rocks or grass or fence posts … no pegs there. Everything dried quickly so by the end of the day we had lots of clean clothes and bedlinen. 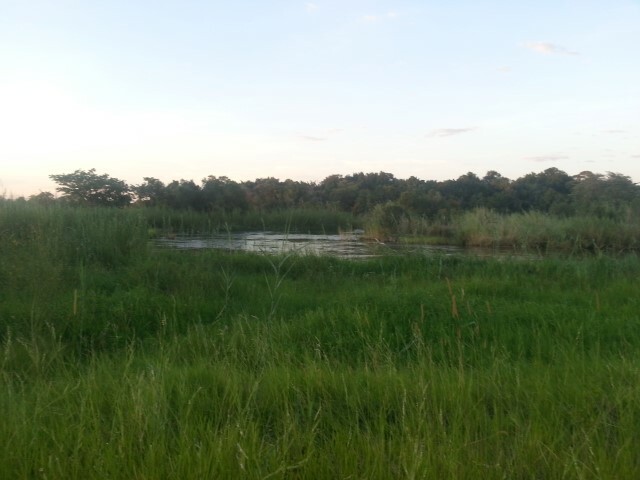 We really noticed a difference in Rundu, compared with when we visited 4 years ago. Back then it was a dusty town with only a couple of sealed roads. This time, lots of the town’s streets have been sealed, there’s new housing, new shops, new businesses, even a private hospital! 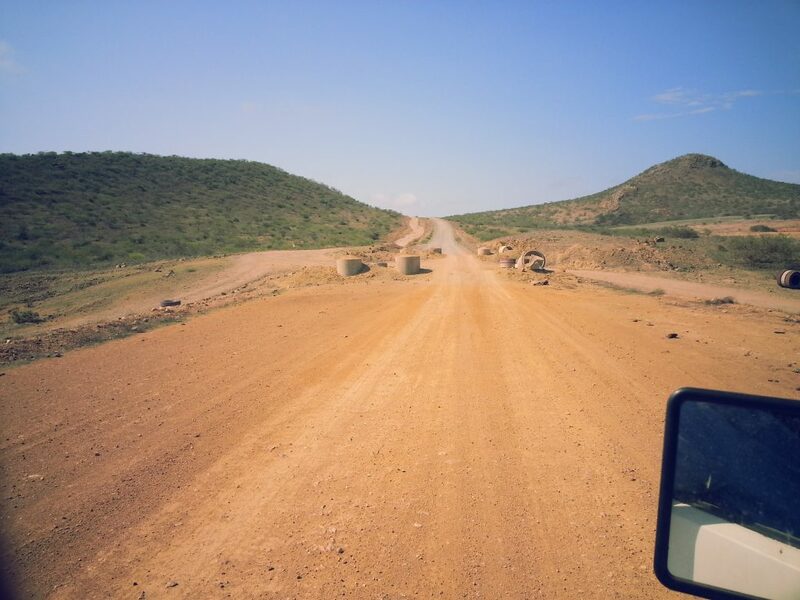 The first time we drove through this part of the country, we thought it was all quite primitive, with the compounds of thatched huts made of sticks or mud. Now we think they are all so neat and tidy after some of the things we saw in Angola. Perspective. 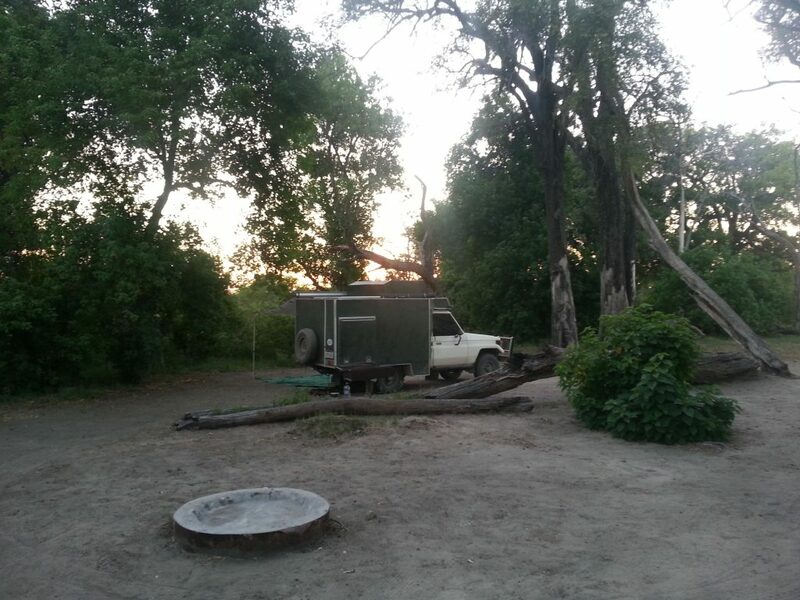 Last night we stayed at another good campground, the Mobola River Lodge just a bit west of Divundu. 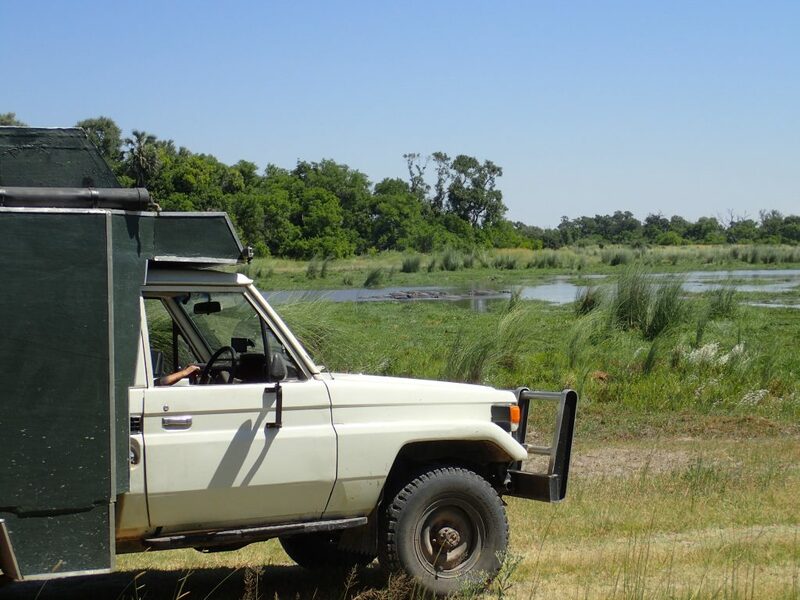 Once again, it’s on the Okavango River with lovely grassy sites and excellent amenities – power, outdoor shower and camp kitchen at each campsite, and we can see across to Angola. Seems like we’re not quite ready to let Angola go. 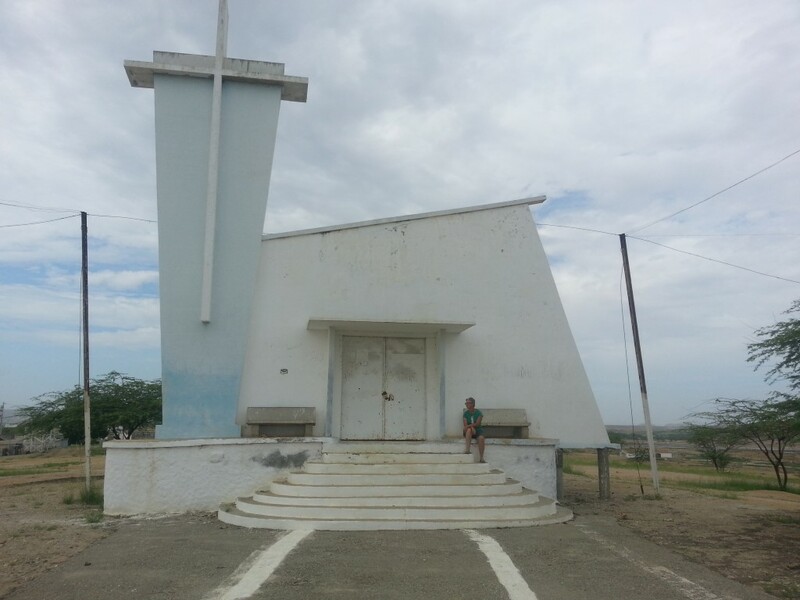 When we were at Sarusungu, I heard a baby cry over in the Angolan village cross the river. It was the first Angolan baby I’d heard cry! They spend most of their early lives being carried on their mothers’ backs, so their needs can be met quickly while the mothers are doing other things -carrying water, looking after their older kids, working in fields. Extreme multi-tasking! We’ve added a new appliance to our kitchen kit – a single electric hotplate so that we don’t have to use our gas stove when we camp in campgrounds. 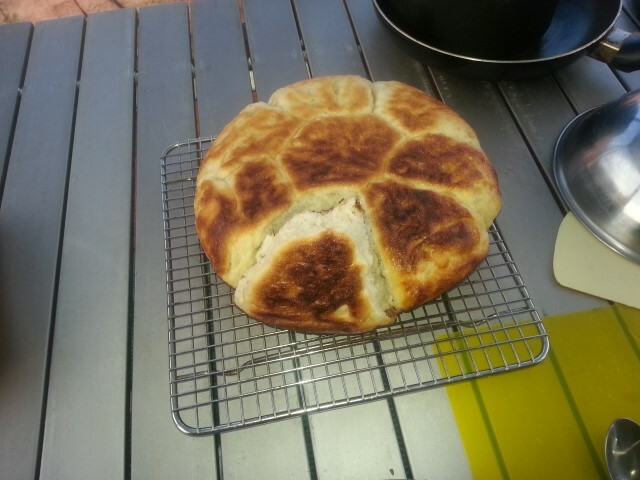 I cooked dinner on it last night and am currently ‘baking’ our frypan bread rolls on it and it’s good. I just need to get used to the slower response time of cooking with electricity, and the temperature control, but haven’t burnt anything … so far! We’re heading south across the border to Botswana today, and will probably be offline until we get to Maun in a couple of days. I love Botswana and have been looking forward to spending some more time there, in part of the country we haven’t seen yet. extending the wheel arch one side because I didn’t make it long enough. 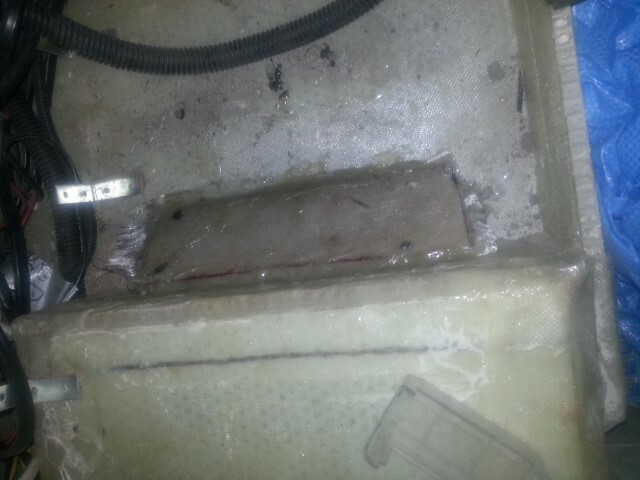 The wheel was bottoming out on the suspension and rubbing away the fibreglass in one spot. We did it! 3 weeks in Angola and we didn’t get sick, injured, arrested or robbed. 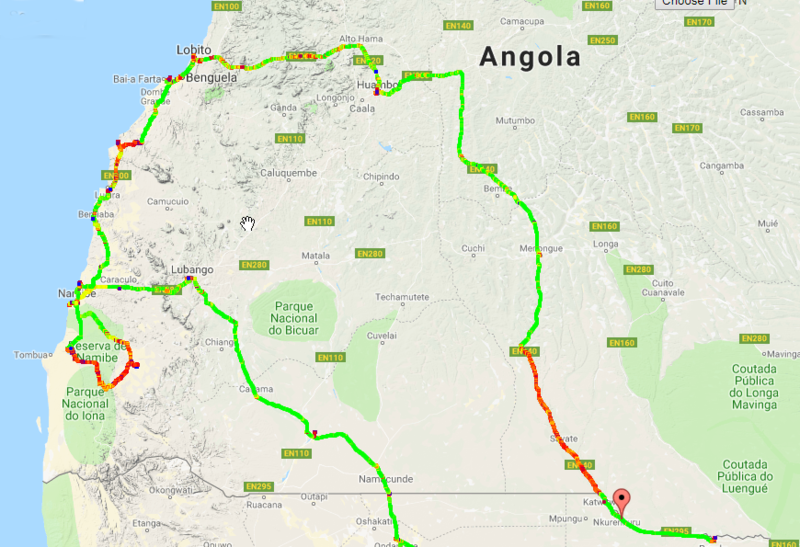 We really enjoyed (most of) our time there, and feel like we got to see a good cross-section of the country and managed to keep away from the capital Luanda which doesn’t seem to have anything much to recommend it. The Scottish oil worker we met at Arco lives there and he told us not to bother. We’ve spent the last few days without internet, so let’s have a quick catch-up. We thought that rather than just head back over the Santa Clara border, we’d see a bit more of the country and cross over further east at Katuitwi / Katwitwi. 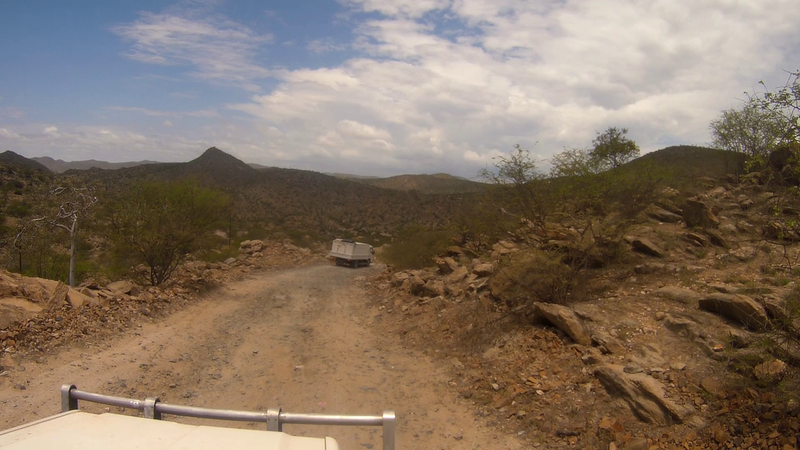 Greg had saved a trip report of someone’s Angola tag-along tour from a couple of years ago and he gave good information about places they had camped along the way, the condition of the road south to the border and how long it took the group of 15 at each border post. The Angolan post had been recently completed when the author crossed it in 2016, and it had taken the group 8 hours to drive the last 250-ish kms on an unsealed road. So, slow going but we’ve been used to that in Angola. Blergh, big mistake! The road must have deteriorated since 2016 and it took us a day and a half to do what the tag along group had done in 8 hours. To any overlanders reading this, Don’t Do It! Cross over at Santa Clara or Ruacana. 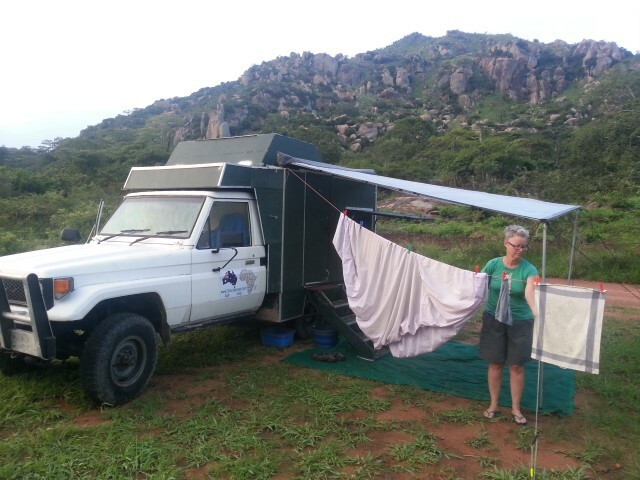 The author had also very helpfully mentioned a couple of quarries they had camped at along the way, and we stayed at them too, but as we realised the last section would take us more than a day, we had to find somewhere to camp about 60kms north of the border post. 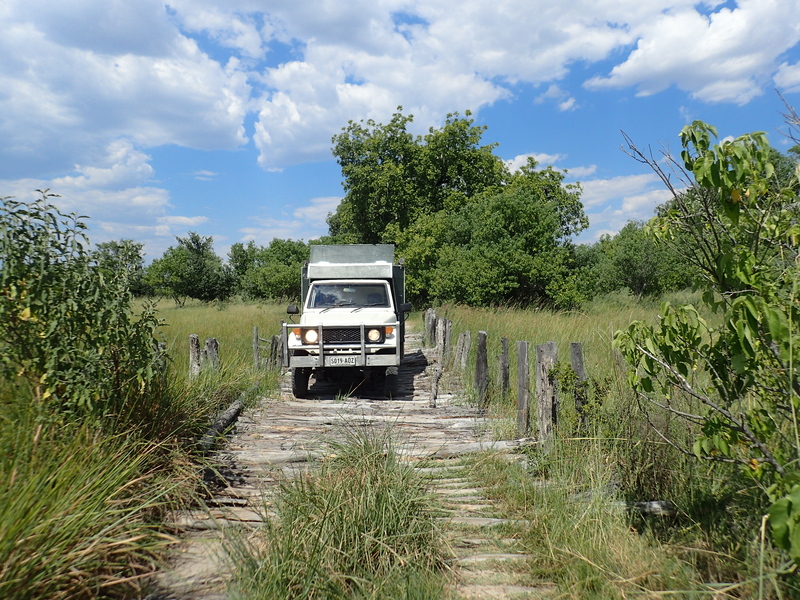 In this still-heavily landmined area we couldn’t risk just going off-road and finding something, and there were no convenient tracks for us to just head down, so we ended up on a narrow piece of land between 2 tracks where vehicles had driven to get from one to another. Basically, we camped on a median strip! 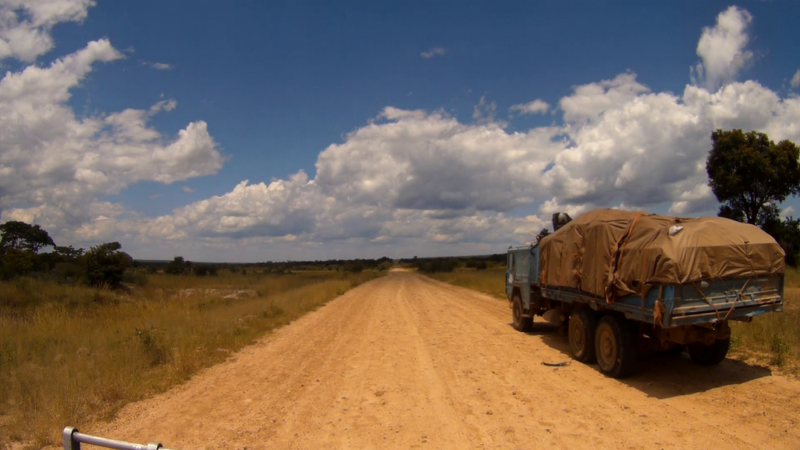 The border crossing at both the Angolan and Namibian posts was pretty easy, once we actually found where to go at the spiffy newish mostly unused Angolan post. There were 3 entry booths and an enormous commercial building, a bit like the one at Santa Clara,but it was all sitting empty and overgrown with weeds. No signage, so we just drove until we were stopped by a string across the road, then had to be shown where to find the single immigration desk hidden at the back of a building. It all went smoothly but we were a bit baffled that the customs lady insisted on inspecting nearly all our storage boxes. Um, we’re leaving, what could be in any of those boxes that might be of interest? Anyway, her English was good so I gave her my 2 Women’s Weekly mags. It’s such a quiet post, I thought she might need something to do to keep occupied. The Namibian side was fine, but Greg had to show the Customs lady there how to fill in our carnet as they don’t get many of them. I noticed on the Immigration officer’s daily log that we were number 4 & 5 to pass through, at about 10.30am. And then when the policeman was checking our paperwork, Greg noticed that ours was the first vehicle for the day. 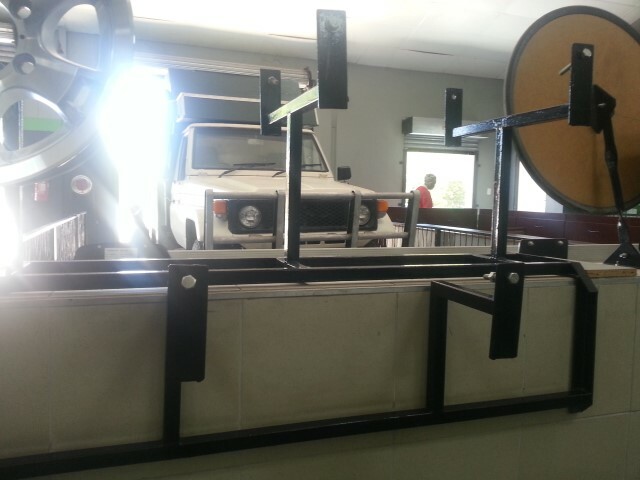 For some reason, even though we had paid our road tax when we entered from South Africa and it was valid for 3 months, we had to pay it again because we were entering from Angola. 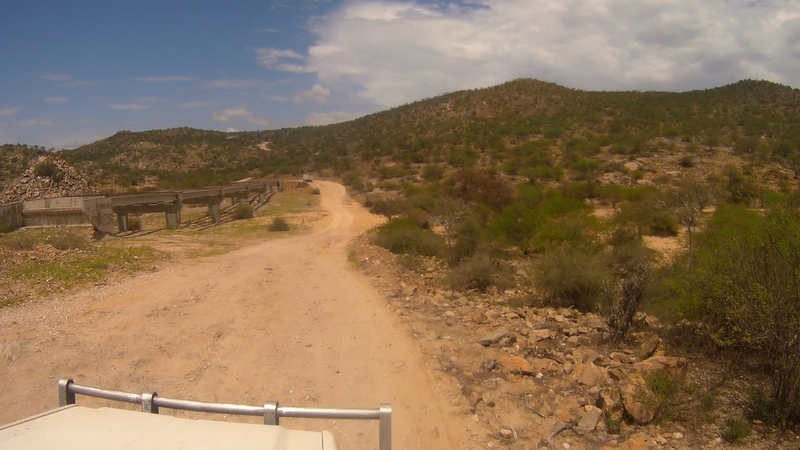 And then we were back in Namibia, driving on the left hand side of the road, on a sealed road with line markings and street signs and all that stuff were used to. It was bliss! 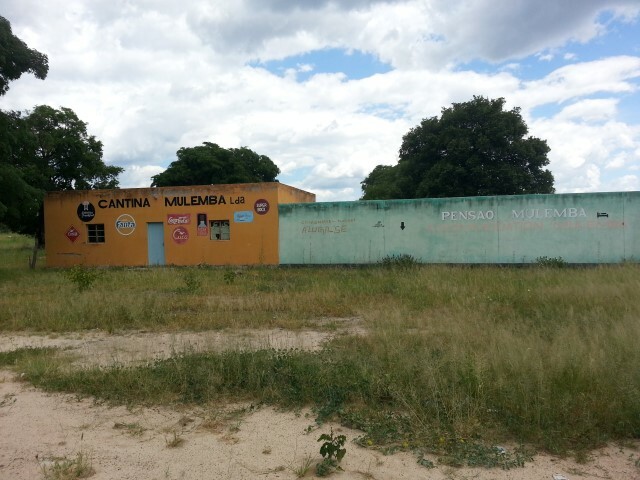 This is getting a bit long, so I’ll just add a few general comments about Angola – everyone we met, spoke to and even drove past seems happy and friendly. As a nation the population has a lovely disposition despite, or maybe because of, the incredible hardship of that long civil war and the ongoing poverty amongst the majority. 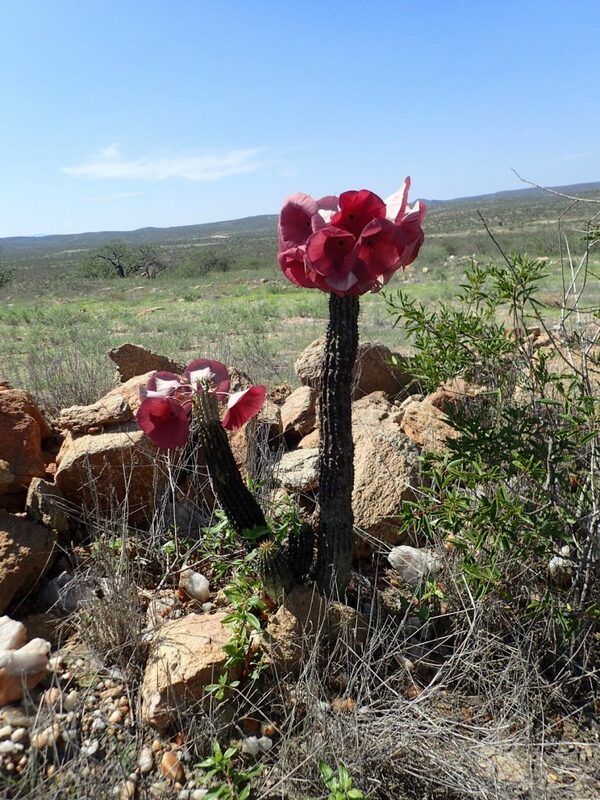 One of the saddest things we saw were small patches of shredded casava/manioc/yucca being dried on the margin of the main sealed road south before it became a rutted nightmare – what the South Africans call the ‘yellow lane’, the safety or breakdown lane. Better-off locals would dry it in flat baskets or on large squares of fabric within their compound. 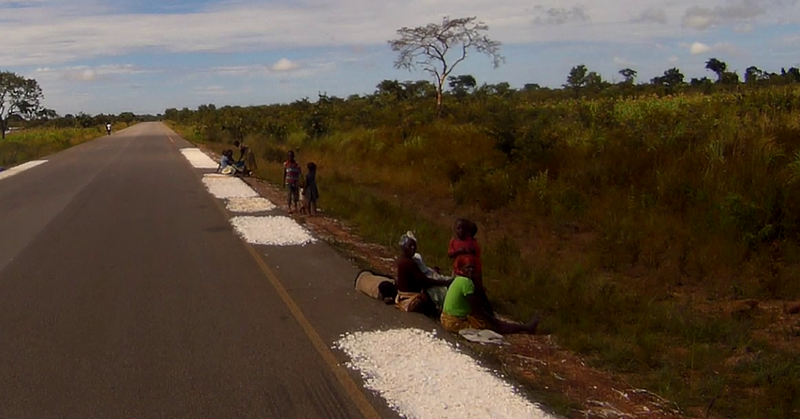 The poorest people just dried it direct on the bitumen and hope that no vehicle drives over it. When the manioc is dried, it is scraped up, pounded to flour and then mixed with water to make a grey porridgey gloopy mass that is consumed at breakfast, lunch and dinner with small amounts of spice, meat and vegetables. Maize is treated in a similar way. 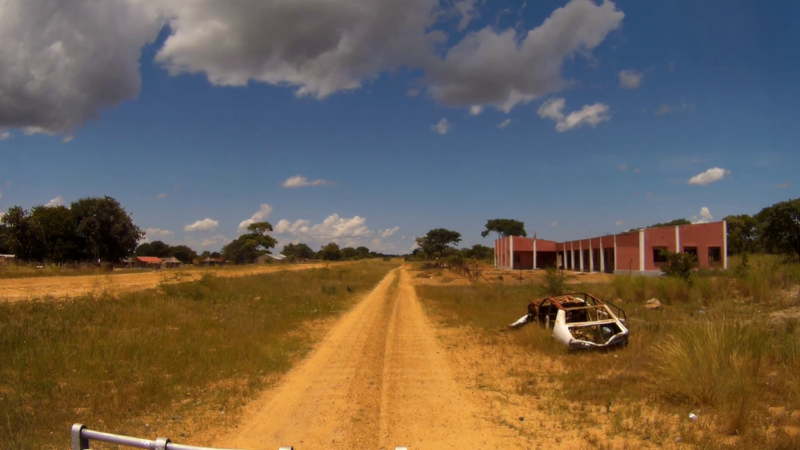 We saw so many abandoned or incomplete projects, buildings, roads, bridges, multi-storey hotels. This is not a poor country, thanks to its oil, but mismanagement, waste and probably corruption is on a scale we have never seen before. Would we recommend Angola as a travel destination? 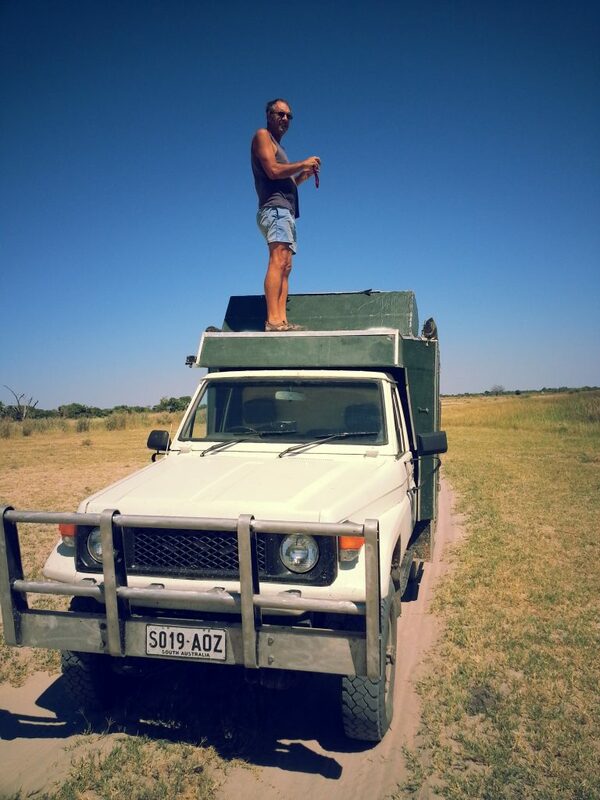 Unless you’re an experienced Overlander and have visited other African countries … no. 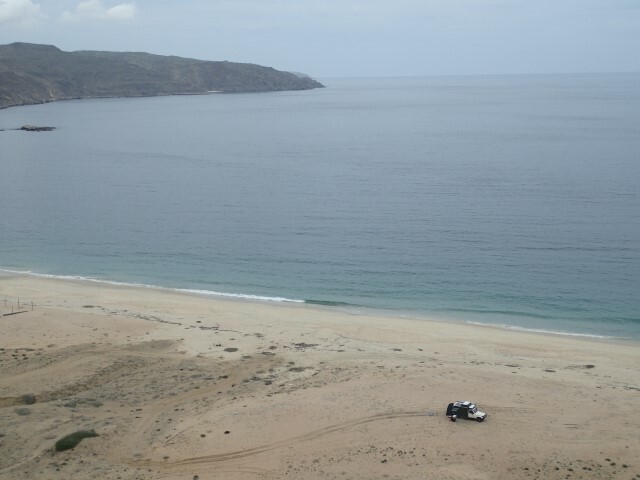 But if you are an Overlander .. absolutely. We’ll remember those 3 weeks for the rest of our lives. Every cellphone tower had a guard. They usually lived in a grass hut, next to the latest in 21st century technology. We had a few ‘first experiences’ yesterday before our encounter with the local cops last night, which was another ‘first’ for us, well in this country anyway. 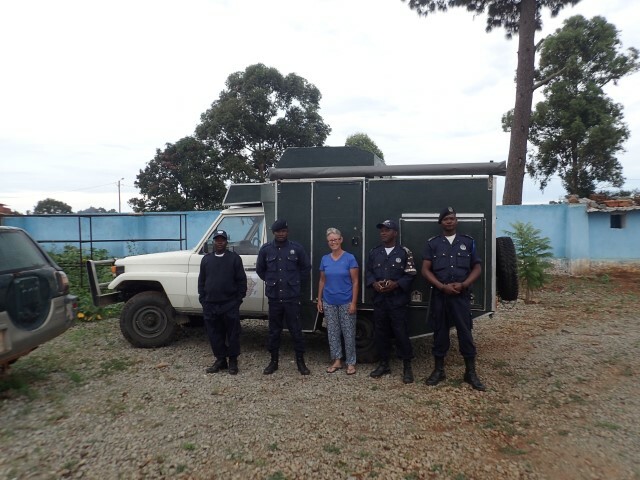 We’ve seen our fair share of police stations and other official offices in our travels. There was the ‘we got deported from Russia‘ story that we still dine out on, 6 years later. Long before that, in 2001, there was the time we were cycling in Vietnam and staying in a small town about 30kms out of Hanoi. Not at all touristy, and apparently by midnight word had got around about the 2 white people on a ze dap hai noi noi bicycle for 2 people. I still remember that phrase, although my spelling is probably incorrect. The owner of the hotel knocked on our door at midnight and told us we had to go to the police. So the 3 of us all hopped on his Honda Wave motorbike and rode in the rain to the local police station, where the cops examined our passports and visas and wrote a heap of stuff in a big book. Then the 3 of us went back to the hotel on the motorbike in the rain. No helmets of course. We stopped and bought bananas from a roadside seller. Small and tasty, according to Greg. A couple of dozen cost 50c. I also bought a bunch of aromatic herbs from a woman sitting nearby for 25c. I didn’t really know what to do with them, but she was delighted to sell them to me. Not far up the road, 3 young men were doing some informal road repairs – filling in potholes with dirt. We’d seen this before and just driven past – in our defence, the first time we were very preoccupied with keeping all 4 tyres intact until we could get to the next town. But this time, we stopped and handed over a small amount of money to say ‘thanks’. And then we passed a real cafe, with a verandah, chairs, tables and real tablecloths. 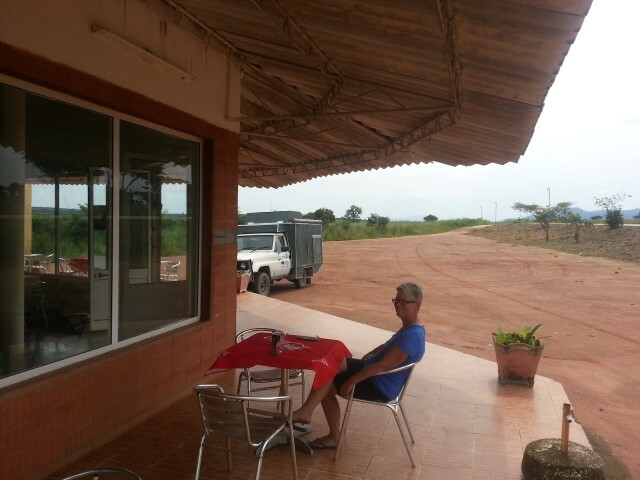 So we turned around, stopped and had the first drinks that hadn’t come out of Clancy’s kitchen or bar since we arrived in Angola. We were the only ones there, but it was 10am so hopefully things got a bit busier later in the day. 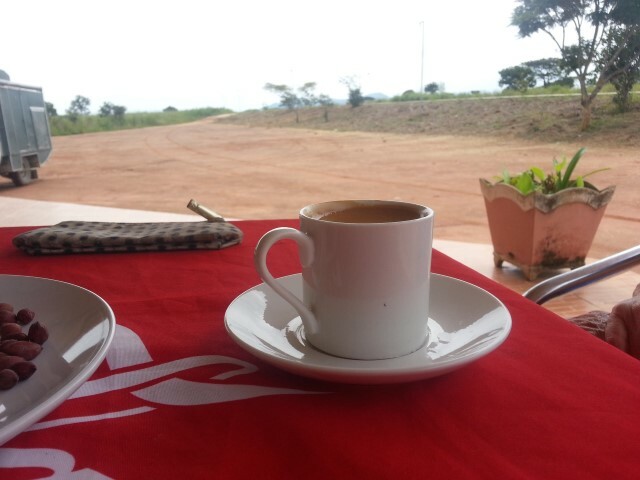 Greg had a Coke Zero, I had a very good short black coffee and the owner gave us a plate of peanuts as well. When we first arrived, he was playing music videos of Smashing Pumpkins, then switched to a telenovella soap opera, I think. They sound the same in every language. 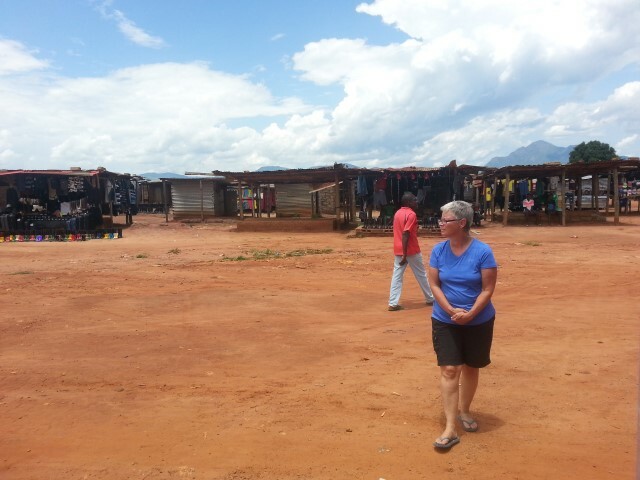 One more thing on our Angolan wishlist was to visit a local market and we did that too. Greg stayed with the car, I wandered around a couple of rows of sellers in the used clothes / fabric / cheap Chinese crap section. I’d thought maybe I’d buy some fabric to take home, but realised that, of course, it’s all made in China and while it looks great on the women here, it will just look like cheap Chinese fabric when I take it out of context and get it home. Kids taking their chairs home from school. 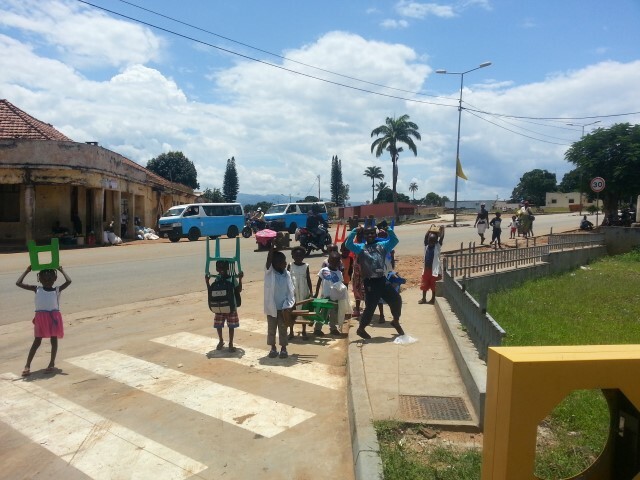 We didn’t see this in southern Angola, it seems they are too poor to afford chairs to take. The incredibly rare roadside cafe on a remote rural road. Camped the previous night, which was much more successful. 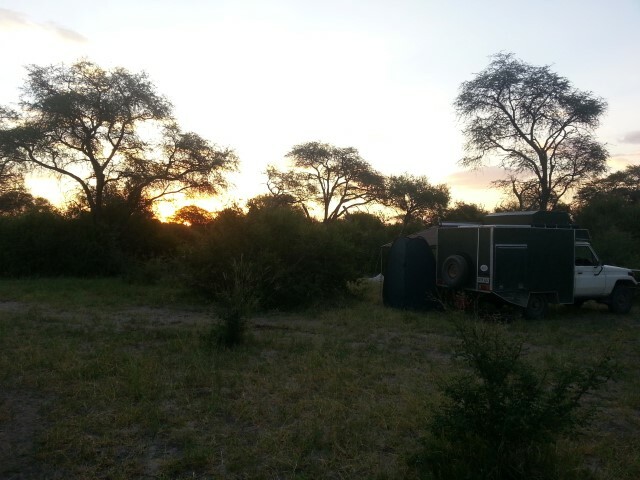 We camped on a small track between villages. This was a small field opposite our campsite. 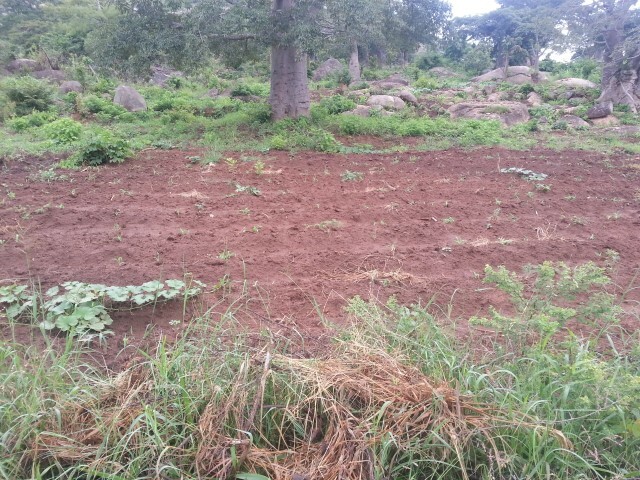 There are lots of small fields like this, in what seems could be an incredibly productive agriculture area. This post is dedicated to our young French friend Joffrey, who explained to us what ‘gasosa’ means here. Estamos juntos – I wish I’d remembered to say that to the nice policemen last night and this morning! The Portuguese word ‘gasosa‘ means soft drink. The Angolan meaning has been slightly twisted, and here it means paying a small bribe to a local cop. We have been stopped at a lot of local police checkpoints, up to 4 per day sometimes, but haven’t ever actually been asked for a gasosa. For the last couple of days, whenever we’re stopped and the police realise we’re touristas tourists, they wave us on. 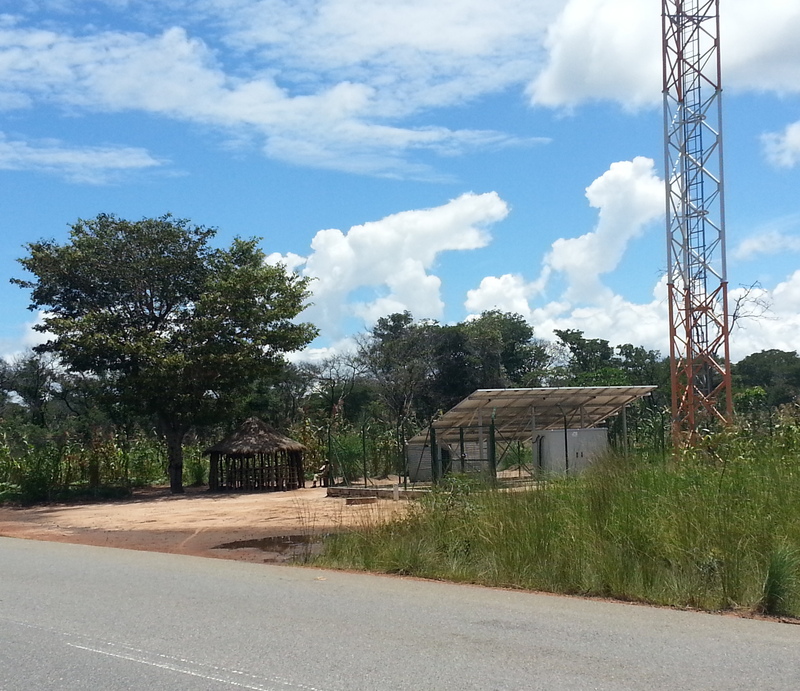 We’re heading east to Huamba, 2nd largest city in Angola. 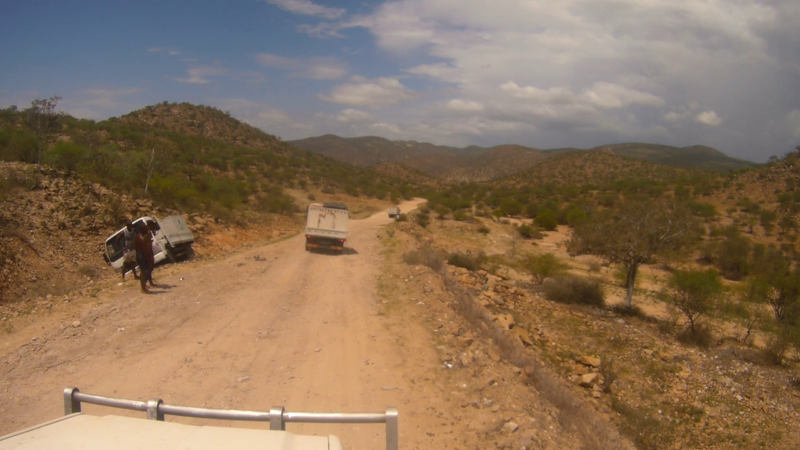 It’s been a bit trickier finding places to camp, and iOverlander has been a bit light on with suggestions. This area has a lot more agriculture, villages and people than we’ve been used to in the south. 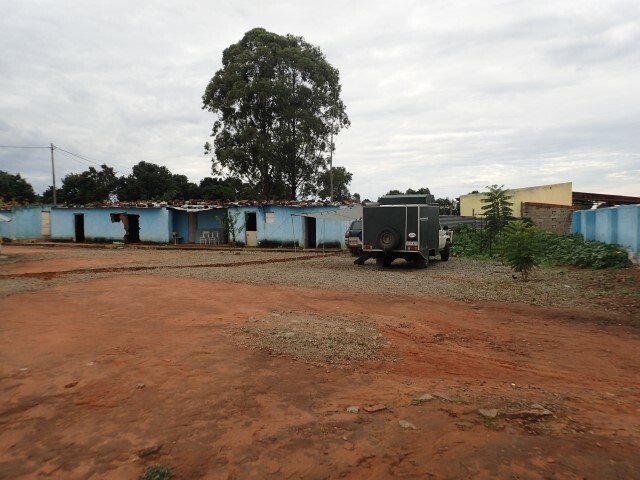 Last night we found a spot seemed to be okay – down a side street behind an abandoned factory in a village 30kms north of Huambo. 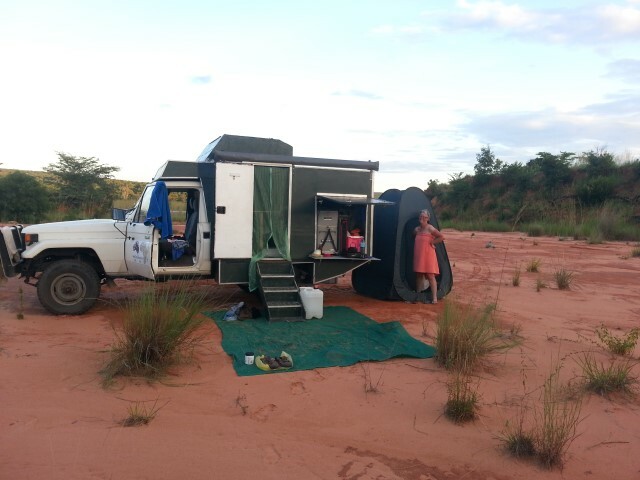 We did the usual thing, set up camp, cooked dinner and had just decided that we’re going to head south to Namibia, not do a side trip to Cuito Cuanavale, site of the bloodiest battles of the Angolan civil war. We don’t really have time and it’s still heavily landmined. I think I heard that collective sigh of relief from our parents when they read that. We heard voices outside the camper and after sitting for a minute or so hoping they would just go away, Greg opened the door to 3 policemen! 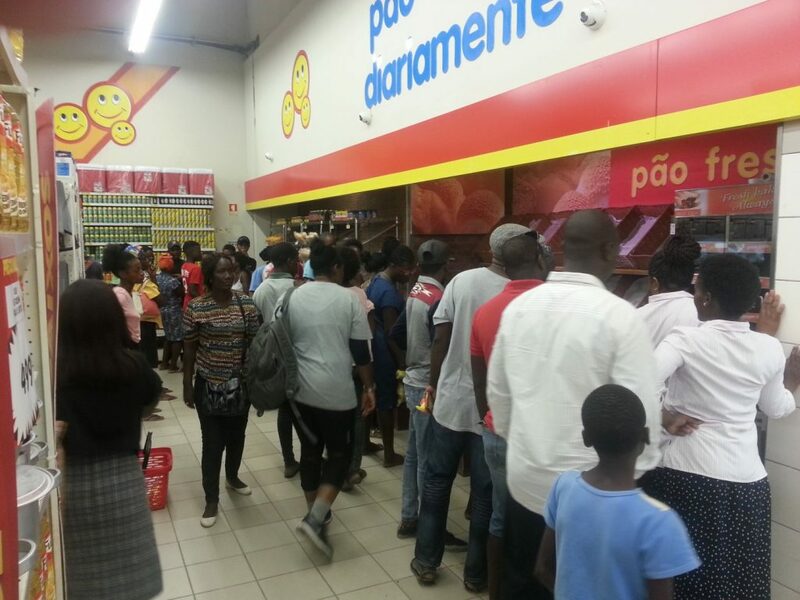 We introduced ourselves, emphasising that we’re tourists and that we love Angola. One of the cops asked if we had any weapons (what?! us?! of course not! ), then insisted on looking in our under-seat storage boxes. The commandant told us to take down our shade and to get packed up. Every time I smiled at the 3rd cop, he smiled back, so I was hopeful that we weren’t in too much trouble. No one ever asked to see our passports or any paperwork, and as we’ve mentioned before, Africans love paperwork. So, we’re all packed up, sort of. Actually, we had just thrown everything into the camper and figured we’d sort it out later. And suddenly there’s another guy there, a civilian. Then the commandant indicated that we had to take the 4 of them with us to … somewhere. We made space for 3 along one bench and left the door open at their request. The commandant and I sat in the front with Greg and we drove back out to the main road and parked near a single-room police ‘station’. We realised that the 3 cops who had visited us had all walked down to us from their station in the dark. We waited there for a while with the commandant, who spent most of the time on the phone. The civilian went into the office with the 2 other cops and eventually a young man came out to talk to us in English. 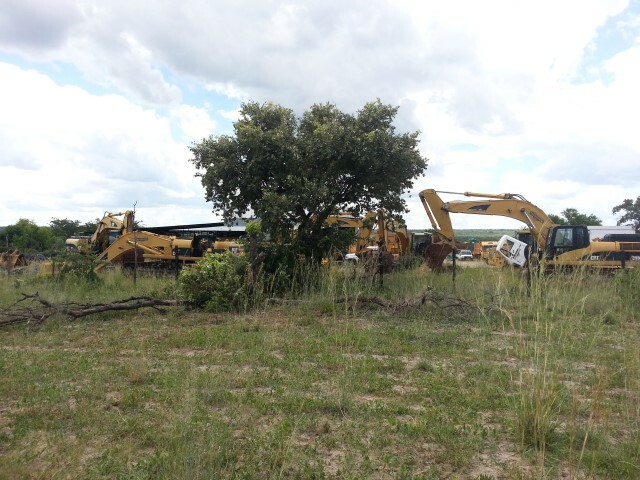 He explained that we weren’t in trouble, but that the whole area fasenda was owned by someone and they had complained about us being on his property. He said something about the area not being safe, which Greg and I interpreted differently – I thought he meant that we were unsafe there because of I’m-not-sure-what. Greg thought he meant that it was not okay for us to camp anywhere in the area because of the owner’s feelings about the matter. And then the commandant indicated that he, Greg and I were going to drive somewhere else, following the other 2 cops who were on a moto motorbike. I hopped in the camper with the door closed, we drove about 5kms down the road towards Huamba and parked in the grounds of a larger police station, where there were at least 6 cops sitting, standing and chatting. The commandant indicated that we should get our shade out, meaning that we could camp there for the night. Still no requests for passports or any paperwork. As soon as we got the shade up, with the commandant’s help, I got out our stash of cans of Coke Zero and Savannah cider and presented them to him and indicted they were for everyone to share. His face lit up, we thanked each other profusely, shook hands and that was that. The nice policemen enjoyed their beverages, we got set up for the night and after a while the commandant walked out of the compound, presumably to walk back to his own station. This morning we just got packed up, got the 4 on-duty cops to stand with me by Clancy so we could get a photo and headed off on our way. At all times, all the police we interacted with were polite and professional, and there was never any suggestion of a ‘gasosa’. We did see the irony of handing over a dozen or so cans of soft drink and alcohol, but were happy to do so, and they were happy to have them. 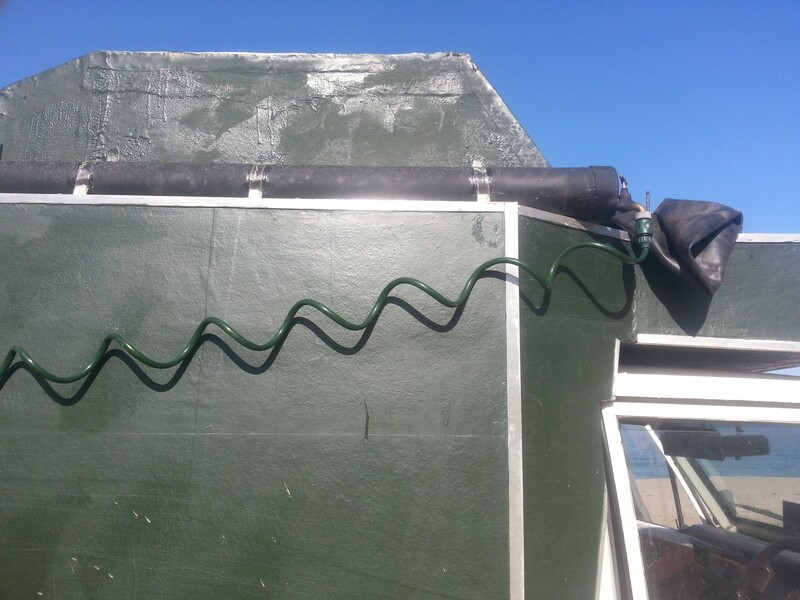 Filling up the solar hot water tank. We constructed it from plumbing parts. The Church on the outskirts of Benguela, which is the top tourist destination mentioned in the Angola guide. 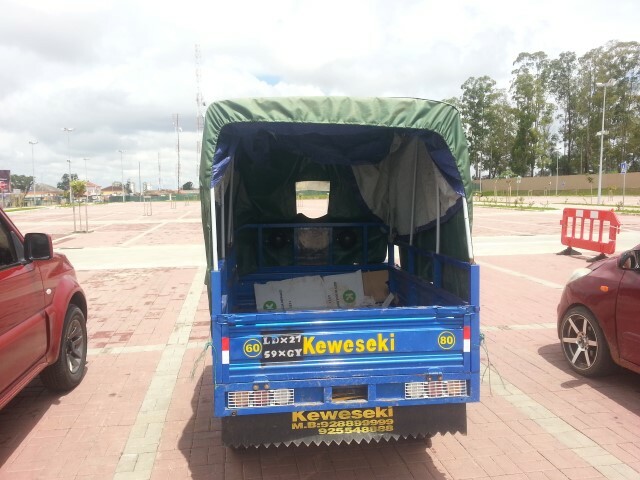 Parked at the Shoprite Supermarket Benguela. The car park is nearly empty, yet outside the car park are lots and lots of people. Only the rich people shop at Shoprite, and the many security guards keep everyone else out. 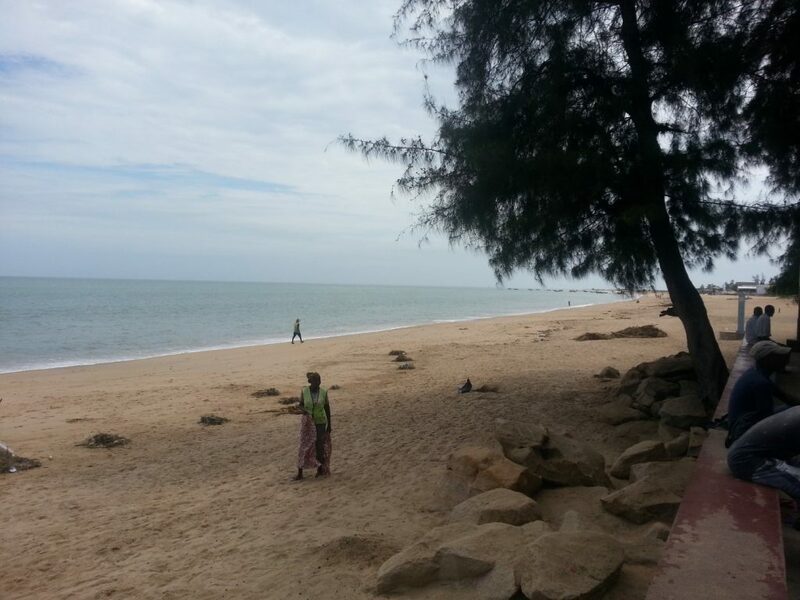 We’ve just spent several days at Binga Bay, which is about 150kms south of Benguela. 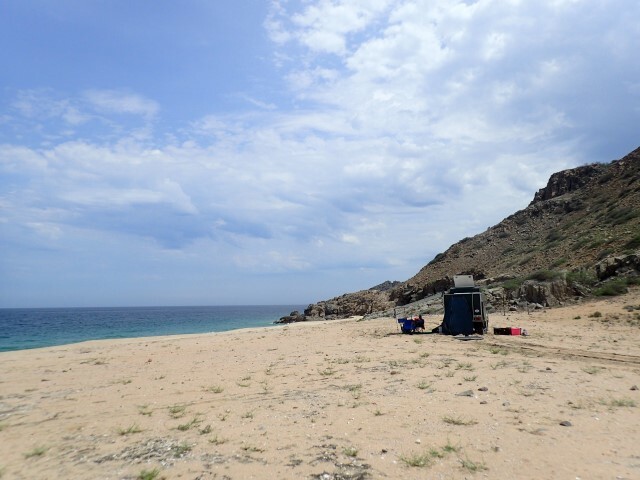 No internet, no one else there, secluded bay with a lovely beach. We swam, slept, I read 2 books and Greg probably read a couple more than that.